I need janitorial services. How can I get a free estimate? That's easy! Just click here for our Contact Us page and you will see several options. Just pick one and we will schedule a site visit in order to develop a customized estimate just for your business. When is the cleaning to be done? Usually, we will arrive after hours for all the cleaning in order to do the work efficiently and keep your cost down. But most importantly, that is the safest option. If however, that is impossible and the work needs to be done during business hours, an estimate can be developed that reflects that. No, unless that is your preference. We believe that our work speaks for itself, and we are comfortable with month to month contracts. In other words, we have to earn your business each and every time. Do I have to provide any cleaning products? No, unless that is your preference. We use top quality cleaning products, from disinfectants to vacuums. Bathroom supplies such as paper towels, tissue, and hand soap are negotiable. How can I make sure I don't spend more than I need to? ​I wrote an excellent blog post on this topic HERE. 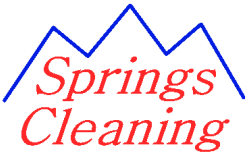 Is Springs Cleaning bonded and insured? Yes. We can supply you with the appropriate documentation upon your approval of our estimate. I have more questions. Can you help? Absolutely. Click here to Contact Us and we will be happy to answer any additional questions you have.